Drill team is where a group of horses work as a team doing maneuvers as one usually set to music. 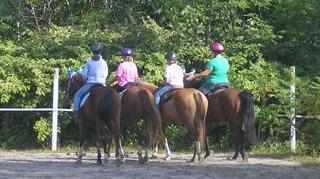 This group is dedicated to encouraging interest in horses, horsemanship, and leadership through proper instruction in riding and drilling (a series of voice commands combined together to form a drill presentation that is fun to ride and pleasing to watch). Drill Team is open to anyone who wishes to learn to ride drills as well as any adult wanting to v olunteer to help. There will be local shows to preform at, and fairs too. Horses are amazing and even if you think that your horse won't be "social" during drill time, beware that they could surprise you, and be the little angle you know is in there. Doing drill is a great way to increase team development, show skills, riding skills, and realistic goals for your personal needs. When joining the drill team this means that you have chosen to commit to the above dates, and will be at all practices and scheduled performances... this could mean Phizer Fantasia at Equine Affaire in Mass!